By Fatima Al Najem Excitement is building up in the community of arts in Bahrain as 18 Bahraini artists, inspired by the Kingdom's impressive wealth of 5,000 years of cultural heritage and outstanding contemporary visions, are participating in Singapore exhibition, which will be held at the Museum of Contemporary Arts, on October 22-27. 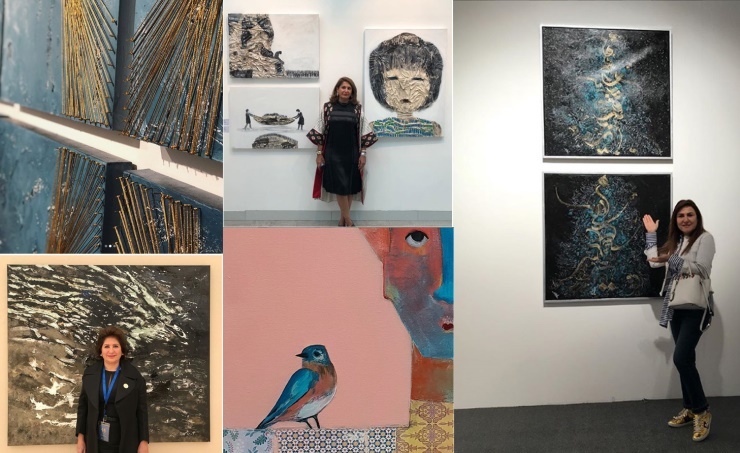 Excitement is building up in the community of arts in Bahrain as 18 Bahraini artists, inspired by the Kingdom's impressive wealth of 5,000 years of cultural heritage and outstanding contemporary visions, are participating in Singapore exhibition, which will be held at the Museum of Contemporary Arts, on October 22-27. Nabeela Mohammed Al Khayer said she would participate with four canvases from the collection “Sound of Water”, mostly black and grey reflections about the depth of water. "Water is the secret of life. However, it is at times polluted by nature and human beings. Pollution is not only something concrete, but can also be the bad feelings of humans who go to the sea. Such negative emotions increase the darkness of the bottom," she said. Nabeela is connected to the Bahraini heritage that is invariably closely linked to the sea. Her ancestors lived on fishing and pearl diving. The sea was, for a very long time, the only way to travel and trade goods internationally. Linda Mattar, the young artist who connects her art to the beautiful presence of birds in the world, participates in her group "conversation with the birds". Her paintings are in pastel colours accompanied by Max Media for the background, and flashy colours for the human figure and the geometrically drawn birds. The paintings represent silent talks between the human being and the bird, which teaches man “How to Live”. "I was inspired by a real scene that I once lived. I was sad that morning; I looked at my garden through my window and I saw a free bird fluttering to get a piece of date from a palm tree, which represents a wish for it. This has made me reconsider the thing that saddened me. We can all be like birds, we reach our faith in the simplest possibilities," she said. Amina Al Abbasi is participating with her “Naseej” collection in which she uses the golden threads that express the connection of precious thoughts. Amina focuses on Bahraini heritage associated with the authentic Bahraini gold, and the original Bahraini embroidery for “Thoub Nashel” called “Zari”, the craft that characterised Bahraini women in the past. "Threads are a language that is translated into art to express feelings," she said. Black and white are Faika Al Hassan's philosophy. She uses ash and raw cloth, which is part of Bahrain's heritage. The artist's paintings are characterised by the existence of people’s figures of varying dimensions and sizes. "Life revolves around human beings. Can you imagine Earth without people? So, my paintings are not without (people), we humans form the important base in the composition of the Universe." Seema Baqi is an artist interested in Sufism who has been inspired by her frequent visits to Turkey. Her paintings revolve around Sufis movements, including dancing and playing music with specific instruments. The idea of the Bahraini artist of Sufism represents her total support for His Majesty King Hamad bin Isa initiative to promote and consolidate peaceful coexistence between all and the freedom of expression in Bahrain.